On February 13, American University President Sylvia Mathews Burwell will receive the Elliot L. Richardson Prize for Excellence in Public Service presented by The National Academy of Public Administration at an awards ceremony in Washington, D.C.
"The Elliot L. Richardson Prize Fund and the Academy are pleased to honor Sylvia Mathews Burwell and Leon Panetta for their highly distinguished careers in public service," said Terry Gerton, president and CEO of the academy. "Their hard work and dedication on behalf of our citizens makes them excellent role models for future generations of government leaders." The awards ceremony will take place tonight at the Ronald Reagan Building and International Trade Center in Washington, D.C., with Washington Post syndicated columnist George F. Will moderating a discussion on public service with Burwell and Secretary Panetta. The Elliot L. Richardson Prize is presented on a biennial basis to individuals possessing the outstanding public service virtues exemplified by the late Mr. Richardson. An Academy Fellow, Mr. Richardson served in four Cabinet-level positions in the U.S. government: Secretary of Health, Education and Welfare, Secretary of Defense, Attorney General and Secretary of Commerce. 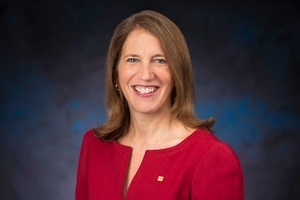 Burwell became American University's 15th president in June 2017. She is the former Secretary of the U.S. Department of Health and Human Services (2014-2017) and former Director of the U.S. Office of Management and Budget (2013-2014) during the Obama Administration. Her prior government experience also includes Deputy Director of the Office of Management and Budget, Deputy Chief of Staff to the President, Chief of Staff to the Secretary of the Treasury, and Special Assistant to the Director of the National Economic Council. In addition, she has held executive roles at the Bill and Melinda Gates Foundation and the Wal-Mart Foundation. She now joins an impressive group of public servants and recipients of this prize such as John Koskinen, William Ruckelshaus, Sheila Bair, Paul Volcker, Robert Gates, James Baker, George J. Mitchell, Colin Powell, Alice Rivlin, George Shultz, Norman Mineta, Sandra Day O'Connor and Lee Hamilton.